Psi (pronounced 'sigh'), the twenty-third letter of the Greek alphabet (Ψ), is the name given to apparent parapsychological or psychic faculties or phenomena (what is commonly understood as 'The Paranormal'). 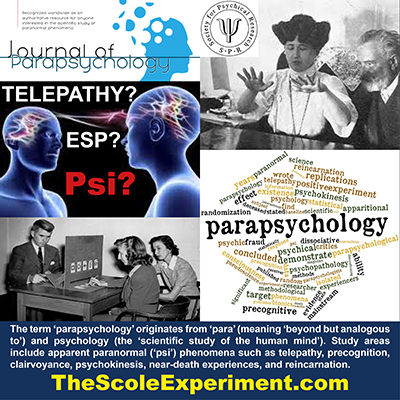 For the purposes of this, TheScoleExperiment.com, website, when we refer to 'Paranormal Science', we mean the scientific study of the paranormal. However, it is in the nature of Psi phenomena that the usual Scientific Method outlined on the Normal Science page is not necessarily the optimum way of conducting paranormal research. For example, during The Scole Experiment, Professor Ellison, a distinguished electrical engineer, said that the Germanium Receptor Device (GRD) 'should not work according to normal physics'. The 'Communicators', or 'Team of Many Minds' as they called themselves, replied: 'This is our science, not your science, please try to do as we say and it should work'. The Receptor did actually work using Paranormal Science and enabled two-way communication, that is, 'coherent dialogue', with various 'Communicators'. In our experience, Paranormal Science often yields better results than Normal Science when investigating paranormal phenomena. For example, human instruments, (usually known as 'mediums' or 'sensitives'), can use their mind/brain mechanism to make 'contact' with 'Communicators', where Normal Science might fail with its instruments. Our interest is in collecting and reporting on 'Paranomal Evidence' which has been by obtained by both 'Normal Science' and 'Paranormal Science' means; or often by a combination of both, as in the Professor Ellison/GRD example above. Funding for unconventional scientific research projects can be obtained from various Funding Sources. Is Consciousness More than the Brain​?